Combine all ingredients in 3 quart slow cooker. Cook on high 3-4 hours. yummy! I served it over wild rice. In a large nonstick skillet, heat oil on medium-high flame. Add scallion whites and green curry paste; sauté one minute. Add shrimp and garlic, season with salt and cook about 2-3 minutes. 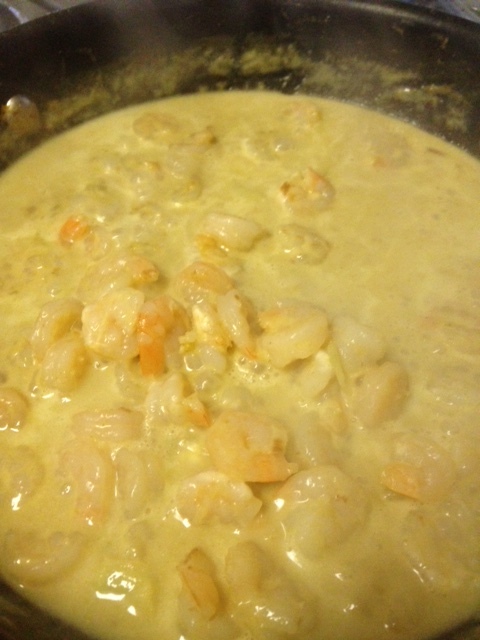 Add coconut milk and mix well; simmer about 2-3 minutes, or until shrimp is cooked through. Remove from heat, mix in scallion greens and cilantro. Serve over basmati rice. You can adjust the heat to your liking by adding more or less green curry paste. Yield: 4 servings. Per serving (not including rice)= 203 Calories; 9g Fat (41.8% calories from fat); 24g Protein; 5g Carbohydrate; 1g Dietary Fiber; 174mg Cholesterol; 405mg Sodium.